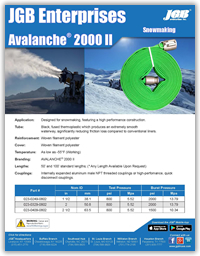 Avalanche® 2000 II Snowmaking Hose - JGB Private Brand - Hose by Vendor - JGB Enterprises, Inc.
A snow-making hose with a high-performance construction. Black, fused thermoplastic which produces an extremely smooth waterway, significantly reducing friction loss compared to conventional liners. Internally expanded aluminum male NPT threaded couplings or high-performance, quick disconnect couplings. * Any length available upon request.